HomeeconomyWhere, Oh, Where Did Our National Debt Come From? The political rhetoric of the current moment, chiefly flowing from Republicans, but barely challenged by the Democrats, describes tales of profligate over-spending by the Federal government matched with burdensome taxation. While it is true that Federal spending is higher proportionately than post-WWII norms, social programs are not the source of this over spending. One only has to look back to George Bush’s two terms to see the true sources of the debt. First up are our profligate wars. A recent study at Brown University’s Watson Institute for International Studies finds that since 2001 we have spent between $2.3 and $2.7 trillion on our adventures in Iraq and Afghanistan.All of these dollars are deficit dollars. George Bush did not ask for increased taxes to fund his wars. 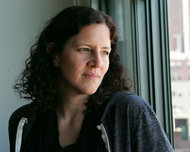 Barack Obama has not asked for increased taxes to fund his continuation of the Bush wars and now his new war in Libya. The final bills for these wars will reach $3.7 to $4.4 trillion. I won’t go into the costs of these wars in lost lives and displaced persons not the enormous moral costs. The Watson Institute website has information on those aspects. We are fighting these wars on the backs of our grandchildren and, as is becoming obvious from the disgusting collusion between Obama and the Republicans, on the backs of the poor and the rapidly disappearing middle class. You might think that since these wars are in our national security interests (the rhetoric of all recent Presidents) they would feel it right to ask the American people to sacrifice more than just our mercenary military but also take money out of their pockets. It has been too easy to have the Chinese pay the bill. Part of the religion of the right is that cutting taxes will increase economic activity and in the end generate higher tax revenues. History has proven this theory to be nonsense. George Bush, aided by members of Congress, both Republican and Democrat, passed enormous tax decreases. These bills with their charming titles, Economic Growth and Tax Relief Reconciliation Act of 2001 and Jobs and Growth Tax Relief Reconciliation Act of 2003, created an enormous windfall for the rich and have not produced any job growth. In fact George Bush’s presidency is marked with the lowest job growth record of any president back to Herbert Hoover see Wikipedia article here http://en.wikipedia.org/wiki/Jobs_created_during_U.S._presidential_terms. 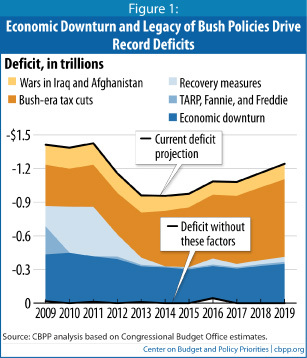 As is demonstrated by the graphic from the Center for Budget and Policy Priorities the tax cuts of the Bush years are the largets single source of debt. Under Tax – But Are We Over Spending? With all of the Bush tax cuts (and the extensions by Obama and the Democrats) Federal tax revenues are now 14.9% of GDP. This is roughly 16% lower than the share typical during the post WWII era while Federal expenditures are 24% of GDP. 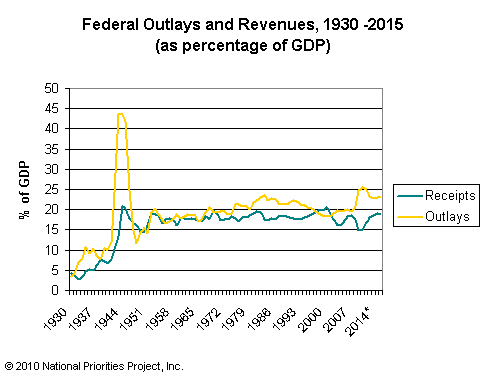 The chart from the National Priorities Project “Federal Outlays and Revenues, 1930-2015” shows the historical trends of revenues versus spending. Note that the projected increases in revenue for 2011 to 2014 are the result of the projected lapsing of the Bush tax cuts. As demonstrated by Obama and the Democrats at the end of 2010, it is hardly a forgone conclusion that this enormous giveaway will not be continued. The chart clearly shows that overall Federal spending is higher than the post WWII norm. Despite the political rhetoric of the moment, it is hardly shockingly high. This is especially true if you take into account the war spending and outlays for economic recovery during what is now obviously the most serious economic slump since the Great Depression. 1. ↥ I won't go into the costs of these wars in lost lives and displaced persons not the enormous moral costs. The Watson Institute website has information on those aspects.